Flavor text: "Its Burning Hell will annihilate all that exists." The Japanese card of the day is our first card to be revealed out of V-BT01: UNITE! TEAM Q4! and the first grade 3 of the format to not possess the Imaginary Gift ability, the Kagerо̄ unit Vortex Dragon. This card is a single Rare with a variable set of skills that work well in both the vanguard and rearguard circles. 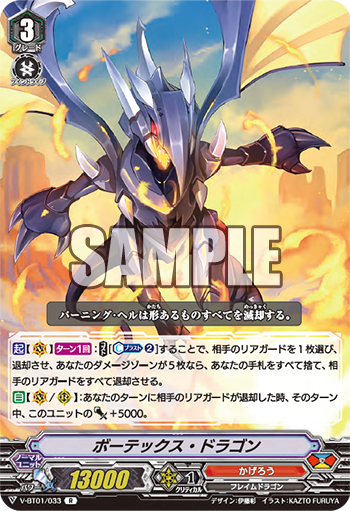 Activate [Vanguard Circle]: [Once per turn]: [Counterblast 2] Choose 1 of your opponent's Rearguards, retire it, if you have 5 cards in your damage zone, discard your entire hand, and retire all of your opponent's rearguards. Automatic [Vanguard/Rearguard Circle]: When your opponent's rearguard is retired during your turn, during this turn, this unit gets Power +5000. 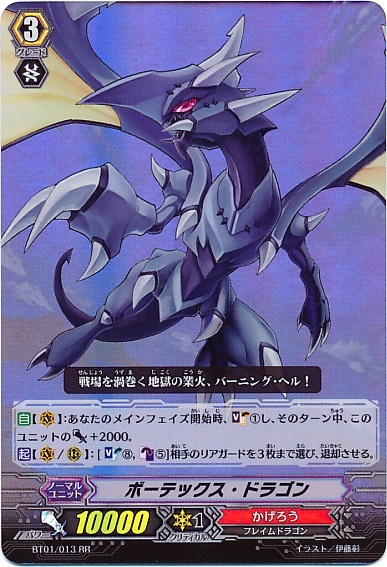 Vortex Dragon is a remake of the megablast unit of the same name, who seven years ago could retire three of the opponent's rearguards for counterblast 5 soulblast 8. (Newer cardfighters might instead recall his direct-damage-dealing legion remake Vortex Dragonewt, or his stride incarnation Vortex Desire.) If the new Vortex is a template for what megablast remakes will look like in the days to come, then it's a welcome change: the new card is infinitely more playable than its namesake. For most of the game Vortex functions like a grade 3 version of the Start Deck card Dragon Knight Nehalem, able to retire any one of the opponent's units at will, and on top of that can become an 18000 base for the turn that makes a nice 28k column with Dragon Monk Gojo. Once you go to 5 damage Vortex takes on the game-ending properties of Dragonic Nouvelle Vague, retiring the opponent's entire field and becoming anywhere from an 18 to a 38k alone depending on the number slain. Discarding one's hand can range from devastating to a noncost, as it's entirely possible to use the skill while having no hand at all. By the endgame both you and the opponent will have used up much of your hands defending, so you could simply call any rearguards you need to and find yourself with nothing to discard. Outside of that it's a skill that has to be used carefully depending on what you're up against, as while it may be safe versus Nova Grappler, a clan with longevity like Oracle Think Tank or even the new draw-heavy Royals may simply shrug off the play. Vortex's second skill is the more important one, as it makes him an effective rearguard that when paired up with Gojo can swing for numbers comparable to Jarron, the major beater of the Royal Paladin clan that's proven so important in the Start Deck demos. Note that Vortex's +5k is not conditional on a unit being retired by an effect, or even during the main phase. If you attack an opponent's rearguard in the battle phase and it retires as a result of battle, Vortex will also power up that way; considering that Dragonic Overlord in the upcoming Trial Deck is implied by Card Gamer magazine to have a self-standing skill, and that past Overlords like the TD01/001 or BT15/004 stood by attacking or hitting a rearguard, Vortex will probably have some mean battle phase synergy with the new support. Not having access to the Gift ability is a significant trade to be making in the deckbuilding process, but what you get in exchange is a rearguard column that stays competitive with what's on offer over in Royal Paladin. 28k in particular is one of the most important thresholds of the new format, because going up the list of magic numbers it's the last value that can be guarded with a single guardian. Only Heal Triggers have 20k shield in the new format, so more often you'll see it defended with two or more cards, and if not then you've depleted an irreplaceable resource from the opponent's hand. 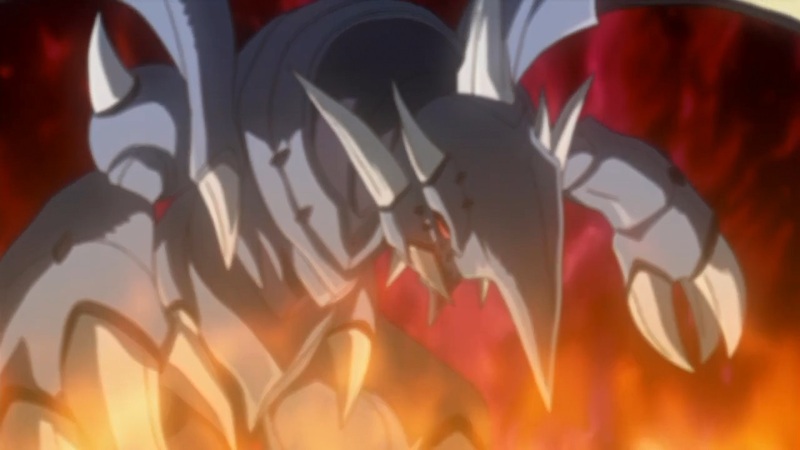 All that said, Vortex is still a single Rare and he has more than just Overlord to contend and coexist with. 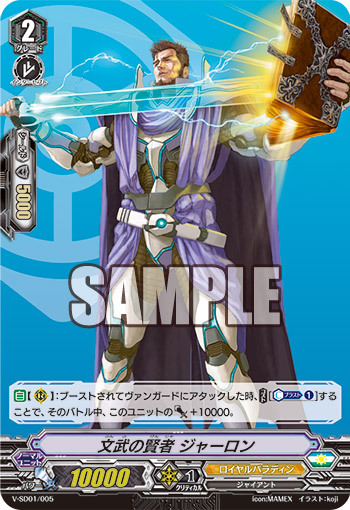 It's just as important that Vortex Dragon stand up to Dragonic Waterfall, Kagerо̄'s high-rarity cover card for V-BT01 that's almost certainly going to come with Gift and a much more powerful vanguard circle ability. Vortex Dragon is designed by Itou Akira and illustrated by KAZTO FURUYA, known for illustrating many G-era units like Metapulsar Huang-long. The previous Japanese card of the day was Knight Squire, Allen.